The Blanche Moyse Chorale begins its 2017-18 season with performances Oct. 6 and 8 of J.S. Bach’s Mass in B-minor. 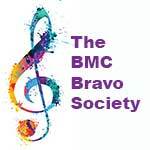 Concerts are set for Friday Oct 6 at 7 pm and the 8th at 2 pm in the Brattleboro Music Center’s Auditorium. In the tradition of the New England Bach Festival, the Chorale performance will feature vocal and instrumental soloists familiar to audiences. These two concerts will be the Chorale’s first performances in the Brattleboro Music Center’s new hall. The Chorale was founded in 1978 by Blanche Moyse as a chamber choir which focused primarily on the Church Cantatas and other choral works of J.S. Bach, and was showcased in the annual New England Bach Festival, as well as in other concert settings. Under the leadership of Artistic Director Mary Westbrook-Geha, the Chorale moves forward with the skills, passion, and musicality inspired by Mme. Moyse. Expanding on its beloved Bach background, the Chorale now explores an ever-widening range of repertoire with a fresh commitment to the highest level of choral excellence, precision and beauty of tone.The Chorale is made up of approximately thirty singers chosen by audition. Weekly rehearsals are held in Putney, VT on Sunday evenings. Please contact the BMC for further information.